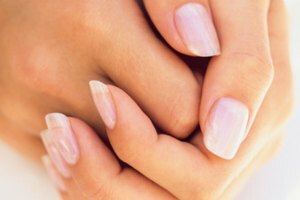 Fiberglass nails, also referred to as resin or nail wraps, are among the finest products used for nail enhancement. They've become very popular because they're light, thin, clear, durable and natural-looking. Unlike other kinds of nail extensions, fiberglass nails are odorless, very unlikely to cause sensitivities or allergies, and easy to remove. However, as with any type or artificial nails, fiberglass nail extensions have some cons. Fiberglass nail extensions are the most expensive option available for those looking for a way to enhance the appearance of their nails. This is due to the fact that the application process can take several hours for both hands. It is also due to the high cost of the fiberglass mesh that is applied to the nails in several layers. Fiberglass nail extensions aren't as durable as other kinds of nail enhancement systems, such as acrylic nails. They're specially not suitable for people who bite their nails, or those who work in professions that require frequent hand washing. Over time, fiberglass nail extensions become brittle when frequently exposed to water and lifting starts to occur. While other types of nail extensions come in kits for at-home application, fiberglass nail extensions should only be done by a professional, as the application process is complicated and the material is delicate. When a chipping mishap occurs to fiberglass nail extensions, the corrective process is difficult and time consuming. Fiberglass nail extensions also require professional touchups every two to three weeks. As with any other nail extension system, poor hygiene and improper care can lead to bacterial and fungal infections. Furthermore, curving of the nails occurs after a while due to the growth of the natural nail underneath. Experts recommend you apply cuticle oil to the nails every day after getting nail extensions to enhance their durability. In order for fiberglass nail extensions to be successful, you need to have healthy nail beds and enamel. This means that fiberglass nail extensions are not suitable for people who bite their nails or those whose nails are damaged, irregularly shaped or unable to grow. Ibtihal Mahmood is a writer from Washington. She began writing professionally while attending the University of Jordan, where she earned a B.A. in English literature. Mahmood has contributed to publications in the Middle East and the United States, including MediaWatch ME, a media-monitoring company based in Dubai, and the Seattle-based "Bicycle Paper." Should You Get a Silk Wrap or Gel Manicure?